Difficulty: Intermediate with a couple of hard bits. 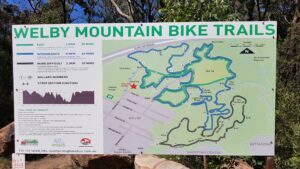 The Welby mountain bike track is a 10km loop and a lot of fun. It’s a nice flowing single trail that is suitable for intermediate riders. Note there are a few hard technical sections. Experienced riders will also have a ball on this fast flowing trail. The trail is home to the Southern Highlands Cycle Club. See their web site for events. The trail flows in one direction which allows you to attach the track without worrying about any head-ons. The trail is extremely well signposted so you’ll know exactly where you are and not need to go to you phone or smart watch for directions. Directions to Welby Mountain Bike Trail. Google Map Link. Drive down Meranie St, Welby, NSW. There is park next to the Cemetery and a large sign post outing the MTB trail. Welby Mountain Bike Trail Map. Welby mountain bike trail Photo Gallery. Welby mountain bike track Youtube Clip. Embedded Google to assist you with directions.